Billet aluminum oil drain / return flange for T3, T3/T4, or T04 turbochargers. Designed to be used with 8mm thread x 1.25 pitch bolts to bolt to turbo. 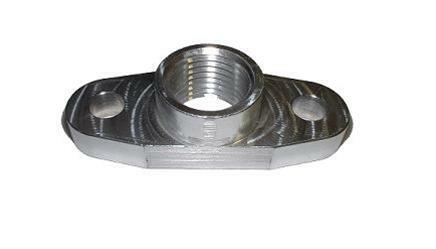 Flange is tapped in the center with 1/2’ NPT for use with any 1/2’ NPT to -10 AN fittings. Also used in larger BB turbos such as GT40R and GT42R. Billet aluminum oil drain return flange for GT ball bearing series turbochargers (GT25R/GT28R/GT30R/GT35R). Designed to be used with 8mm thread x 1.25 pitch allen head bolts. Also works with older T25 and T28 Non-Ball Bearing Turbos.